Silly Lilly is simple comic book for beginning readers. 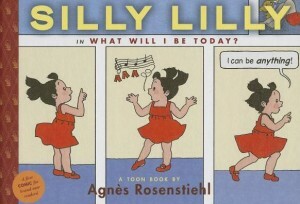 Lilly believes that “Every day is a new day to play!” Readers can watch what Silly Lilly pretends to be (or what she plays) each day of the week. Each section starts with telling which day of the week it is and what Lilly is being. For example it says “So, on Monday Silly Lilly is a cook.” Then there are numbered panels that tell what Lilly is “doing” each day. The panels are simple. They are all the same shape and size and are read from left to right—which is perfect for teaching kids how graphic novels work in a simplified way that won’t confuse beginning readers who have just learned the fundamentals of reading left to right. At the end of the story there is a recap of what Silly Lilly did each day of the week and tells what Lilly did on Sunday (the day that didn’t have its own story). Also, when Lilly is talking the word bubbles have longer tails leaving no question as to the fact that those words are what she is saying (even though there aren’t any other characters in the story). Basically this is a basic graphic novel perfect for beginning readers (of traditional text or graphic novels). Although the story is so basic that those who enjoy just a bit more of an advanced storyline will find this a bit dull. September 24, 2014 in book review, easy reader, elementary school, graphic novel.